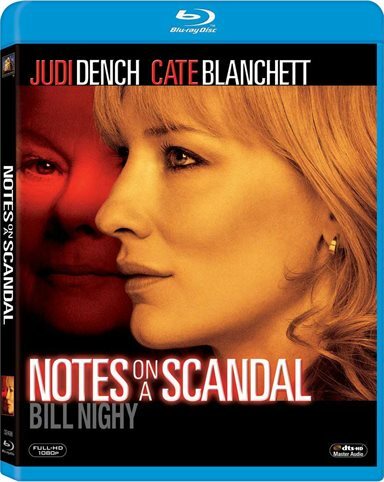 Notes on a Scandal is a 2006 movie starring powerhouses Judy Dench and Cate Blanchett. The film is based on the novel, What Was She Thinking: Notes on a Scandal by Zoe Heller. Also starring in the film is Bill Nighy as Cate Blanchett's husband. In an age of scandal amongst teachers—think Mary Kay Letourneau and Debra Lafave—we have Sheba Hart (Blanchett), a pretty new teacher who begins teaching at a school where Barbara Covett (Dench) has been teaching for years. Sheba, a married mother of two children, one who has Down's syndrome, is an art teacher well-liked by the other teachers, but not by Barbara, at least at first. Later, when given the opportunity Barbara insinuates herself into Sheba's life. Upon witnessing Sheba having intimate relations with one of her teenage students (Andrew Simpson) at a school event, Barbara assures Sheba she will keep her secret and thereafter becomes her confidant and later her Judas. Barbara keeps a diary of her thoughts on her life, the life of Sheba, and their relationship throughout the film, including her increasingly romantic feelings towards Sheba. Barbara's diary entries allow for narration of her affection for Sheba and how strong in her mind their relationship has become and how much better she believes Sheba will be with her than with her family. Barbara, an older somewhat lonely character, we find, had similar feelings for another teacher previously who resigned her position from the school and filed a restraining order to keep Barbara away from her. After being rebuffed when she is in need of comfort by Sheba, Barbara commits the ultimate act of betrayal. Dench and Blanchett's performances are powerful; rightfully so, both were nominated for Oscars. Dench epitomizes the creepiness of her character and Blanchett manages to successfully play both the villain and the victim in such a way that you can't completely hate her character despite the crime she committed. At some points the movie is uncomfortable to watch, but that is for me, simply because of the subject matter. The Blu-ray itself, in 1080p resolution looked great on my home screen. The sound is DTS-HD Master Audio 5.1 mix. The sound mix I find a bit unequal with the audio much louder during any scenes with background music and no dialogue. There are added features which include a behind the scenes featurette, the trailer for the film, and an audio commentary by the film's director, Richard Eyre. Additionally, there is a "Story of Two Obsessions" featurette and an in-character segment with Cate Blanchette. Finally, there are webisodes including a conversation with Cate Blanchett and Bill Nighy. Download Notes on A Scandal from the iTunes Store in Digial HD. For more information about Notes on A Scandal visit the FlickDirect Movie Database.